Barcelona, Spain’s most exciting destination for culinary tours, is also considered to be one of the most cutting edge cities in Europe for 20th-century avant-garde architecture. The city is famous for its “Modernista” style, a Catalan Art Nouveau movement launched at the end of the 19th century. Antoni Gaudi is the most famous architect and is most famous for his unfinished masterpiece “Sagrada Familia”. Secondly, in the last year, Barcelona has been propelled onto the world culinary scene as a serious hotspot of cutting edge gastronomy. Exciting chefs, Michelin starred restaurants, creative caterers and artisan products are increasingly well-known abroad and highly respected. Secondly, in the last year, Barcelona has been propelled onto the world culinary scene as a serious hotspot of cutting edge gastronomy. Exciting chefs, Michelin starred restaurants, creative caterers and artisan products are every day more well-known abroad and highly respected. Read more about Barcelona’s culinary scene below under the Gastronomy and Wine section. Barcelona became a major hub of a city under the Romans after it was founded in 15BC on the Mons Taber, a hill between two streams that gave the colonizing Romans an excellent vantage point of the Mediterranean. They called it Barcino, and modern-day Barcino is in the Sant Jaume square, smack in the middle of the Barri Gotic. From the time of the Romans, various groups of people have inhabited Barcelona and the surrounding region of Catalonia, from Visigoths, Moors, Franks, Aragon Kings, and Catalan Counts. In the 14th century, much of the Barri Gotic was built, and Barcelona was a vibrant multicultural mix of Jews, Christians, Arab traders, and immigrants from all over the Mediterranean. In 1492, Spain became unified and non-Christians were expelled which caused great detriment to Barcelona’s commerce and trade. 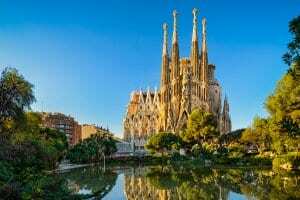 Fantastic monuments can be still seen in modern day, beautiful Barcelona including parts of the ancient Roman wall, the medieval streets of the Gothic Quarter, the 13th-century cathedral and a host of fantastic, historic squares, fountains, and busts. Fast forward a few hundred years, and you have Barcelona at the end of the 1800s. Many French immigrants in the wine trade had arrived, as the Phylloxera epidemic had destroyed their vineyards back in France and they came to Spain to make a living in wine, bringing their champagne method of wine production to the Penedès wine region, south of Barcelona. Spain was in political turmoil with revolts against the monarchy, although at this time precisely Catalonia enjoyed a Renaissance of architecture, industrialization and a boost in the quality of living for the middle classes. The horrific civil war brought that to a temporary halt, and Catalans were viciously opposed to Franco’s “Falangista” movement for a variety of reasons, one being that they were politically very much on the left. Barcelona had always attracted liberals and intellectuals, including George Orwell, Ernest Hemingway, Andre Malraux, and Octavio Paz. After the civil war, Barcelona built itself back up slowly, and since the Olympics in Barcelona, the city has been improving at an amazing pace. It’s said that when Franco died in 1975, virtually all of the citizens of Barcelona took to the streets to celebrate and not a single bottle of Cava (Catalan bubbly) was left in the entire city by the next morning! Today, it is an absolutely delightful place to visit, for art, architecture and history lovers, for foodies, and for designers. Barcelona has become a Mecca for design and fashion, for gourmet restaurants and for modern art. The following list is a very incomplete guide to some of our favorite spots in fantastic Barcelona. Barcelona is the capital of Catalonia. Ever since the Middle Ages, Catalonia has been noted for its delicious and refined cuisine. It is famous for its concept of “mar i montanya”, combining the products of the sea and the mountains to combine inventive dishes. This is the land of Salvador Dali whose favorite dish was lobster with a chocolate sauce! 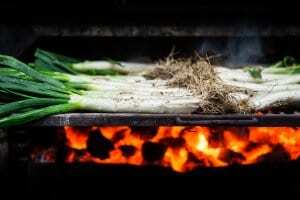 Regional dishes include “Xai a les dotxe cabeces d’all (lamb with 12 heads of garlic), “Arros Negre” (Rice with seafood and squid cooked in its own ink), “Bacallà a la Llauna” ( cod baked in tomato, garlic, white wine and Paprika) “Escudella i carn d’olla”, made of vegetables, rice, noodles and potatoes, “Cocido con judias blancas de Butifarra (a typical stew with white beans and regional sausage), “Pilota” (a dish made with beef, bread, eggs and white beans) and the ever constant “pan amb Tomaquet”, lovely rustic country bread smeared with fresh, juicy tomatoes and Olive Oil. Fish specialties include “Empedrat” (fish cod salad), “Zarzuela”, a dish named after the Spanish operetta and made of cuttlefish, mussels, and prawns, and its more upmarket version, “La Opera”, with spiny lobster. Traditional desserts are Crema Catalana, and the Moorish inspired Postre del Musico (“The Musician’s Dessert”) made with pine-kernels and raisins. Mediterranean Catalonia is also home to some of the most interesting and diverse wine regions in Spain: Penedés (famous for its Traditional Method Cava made with the indigenous grapes of Xarel.lo and Parellada, and for important wineries like Miguel Torres and Jean Leon), Alella (excellent whites, made with the local Pansa Blanca, Carmenet and Bodegas Parxet being the top producers), Conca de Barberà (many of the Miguel Torres vineyards are here, including those used for the famous “Grans Muralles” wine) and Priorat (powerful and elegant reds, some say very similar to France’s Burgundy, top producers being Alvaro Palacios and Rene Barbier). A “Foodie” paradise, what a place! If you want to see sea scorpions and vegetables that look like an alien and broccoli had a child, then check out this gigantic food market. The building itself, the Mercat Sant Josep, dates back to the late 1800s and has a lovely Modernist rooftop. The market is simply one of the most spectacular food markets in Europe, with stall after stall of artichokes, figs, fresh herbs, dates, fennel, radicchio, peaches, bizarre seafood, expensive cured Spanish Ham, olive oils. If you like your wild mushrooms, there is a stall at the back of the market with a massive collection of truffles, “Setas” or “Bolets” (wild mushrooms), chanterelles, porcini. While it is true that the Barri Gotic is quite overrun with tourists during the day and a tad unsafe at night (there is a multitude of organized pickpockets), this 15th century perfectly preserved neighborhood is stunning. The winding streets are like a labyrinth once you enter, and on every corner, there seem to be gorgeous cafes, art galleries and flowers everywhere. The modern-day square “Plaça Sant Jaume” in the heart of this neighborhood was the center of Roman Barcelona in the 1st century and there are still remnants of the old Roman wall. The Plaça del Rei is an exquisitely preserved medieval square. There is a famous café called “Els Quatre Gats” (The four cats) where Picasso and various bohemians and artists used to congregate, and where today you can enjoy a “Café Tallat” (expresso style coffee) while taking in the old photos and quaint atmosphere. Address: Calle Montsio, 3. 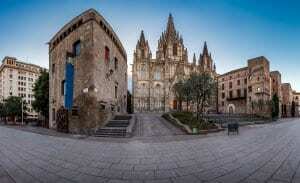 The 13th-century cathedral, in the nearby Plaça de la Seu, is gorgeous and worth a visit. The long Ramblas Boulevard is lined with street vendors, lovely old buildings and stylish cafes. Take note, though, that the Ramblas, while beautiful, is a center of petty crime, so be vigilant while walking through this part of town. Called the “Rodeo Drive” of Barcelona, the Eixample neighborhood is swish, elegant and full of the fabulous “Modernista” architecture. There are tree-lined wide boulevards, chic shops, cute wine bars, and posh restaurants. The best shopping in Barcelona is here, with top end boutiques, gourmet shops, old “Perfumeries”, and the atmospheric wine merchants with brick vaulted cellars, many in lovely buildings dating back to the 1880s. Architectural treasures include: Casa Macaya, a superb “Modernista” (Art Nouveau) building designed in 1901 by Puig I Cadalfach (the “other” Gaudi); Casa Terrades (with Neo-gothic pointed towers), La Pedrera (Gaudi’s most beautiful palace, called “Casa Mila”) and the Hospital de Sant Pau, designed in 1901 by Domenech I Montaner, the other great Modernista architect. If you are into Egyptology, then don’t miss this great, small museum, featuring mummies, ancient jewelry and ceramics from the Nile. Interestingly, the owner of the Egyptian Museum, Jordi Clos, also owns one of Barcelona’s best 5-star hotels, the Hotel Claris. The Claris showcases many of his Egyptian treasures in the public rooms. Jordi’s collection of Roman, Greek and Egyptian antiquities is one of the best private collections in the world. Barcelona wouldn’t be Barcelona if it hadn’t been for a certain Antoni Gaudi. This eccentric genius, considered to be the father of the “Modernista” movement, created landmarks such as Sagrada Familia, Parc Guell, and La Pedrera. He was an obsessive but brilliant man, whose life was cut short at the height of his career by a tram in 1926. Born in Tarragona (home to the famous Priorat wine region) in 1852, he accomplished an astounding number of architectural feats. He had wealthy patrons, including Eusebi Guell, who gave him seemingly full license to indulge all of his frivolities and bizarre ideas. One has only to visit the rooftop of Casa Mila, see the reptilian façade of Casa Batllo and climb the winding steps of the incredible Sagrada Familia to understand his genius touched with madness. Gaudi was one of the most innovative architects of all time.